We are all about approaching the traditional with with a fresh perspective. 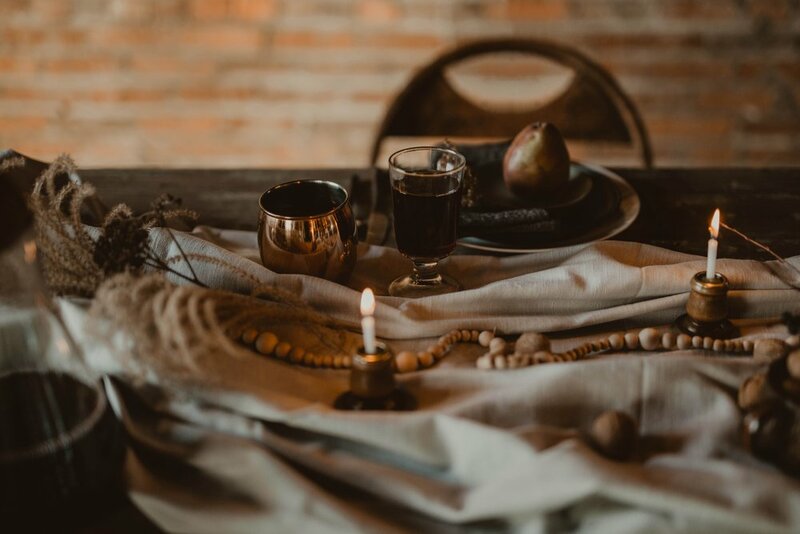 Our intention is to pursue creativity with curiosity, which is why the vision for this shoot was a simple and modern twist on the traditional winter wedding. Instead of using evergreens and highlighting with burgundy and gold, we emphasized an earthy, organic color palette and used all dried foliage for texture. Our goal was to show that seasonal weddings do NOT have to all look the same. We want to empower couples to be brave and know that there is freedom to branch out from a particular style or color scheme. The possibilities for every wedding are truly endless and with some hard work and creativity. 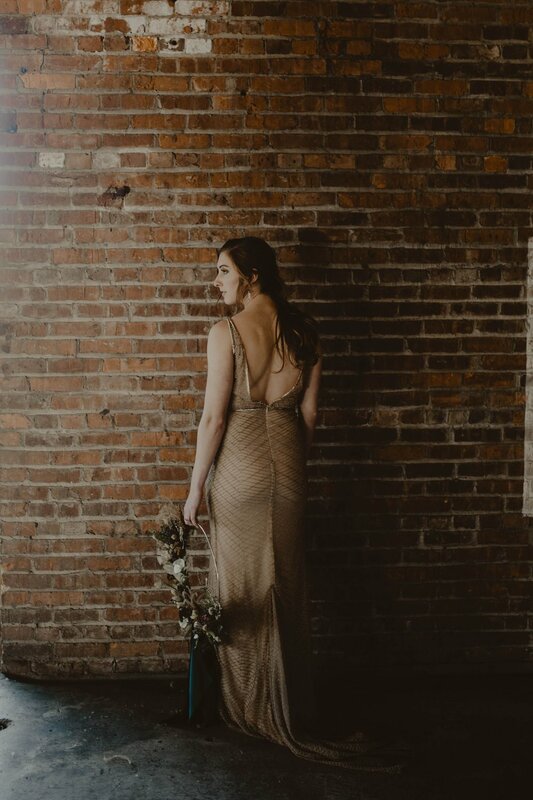 Once again, the vision for this shoot pivoted around this stunning gold, beaded gown from Sarah Seven's newest and unreleased line. It was such an honor to be a part of this launch and to get to work with such a talented designer. We are kind of just left speechless about the opportunities that have been thrown our way since our own launch this past October. Thank you to everyone has shown their support and chosen to join us in this exciting journey we are calling He & She! Enjoy the story behind the scenes of this shoot, and be sure to give all of our vendors some love below! I'll be honest - I had a garbage bag full of cut greens and foliage waiting in my car, just in case the hanging installment did not pull through. I was so nervous that it wasn't going to look like how we had pictured it. But, boy was I wrong! 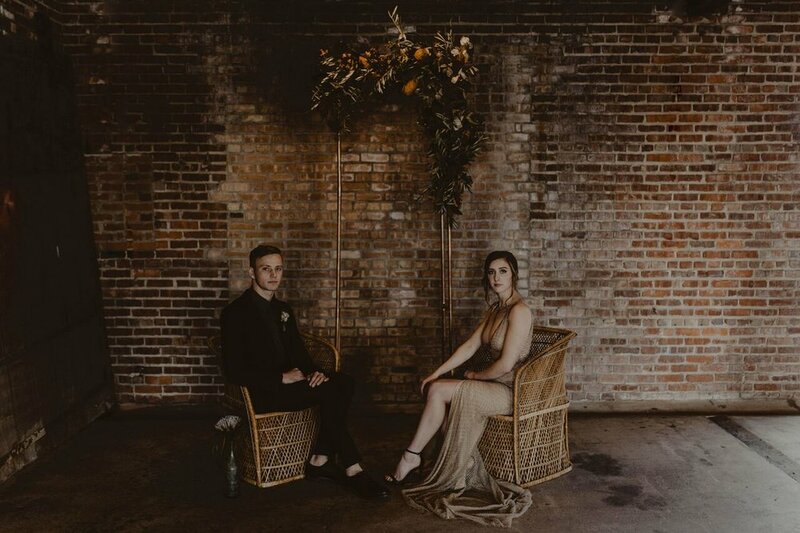 This huge piece from Floral Designs brought this whole shoot together and took our venue to a whole new level of depth and texture. And we LOVE that about 90% of the florals were locally foraged- what is more natural and organic than harvested foliage from the side of the road? These girls are seriously the sweetest and Savannah stayed for the remainder of the shoot to hold our hoop bouquet during off-frames and to offer her coat to our brave and freezing Hilary. We love utilizing vendors who might be considered more of an underdog, but who embody incredible skill - and let me tell you- these girls from Morton are creative, talented, and are about to go big in this business. You better catch them while they're fairly unnoticed, because I promise, they're comin' in hot! You may recognize our models as Hilary and Steele Johnson, photographer and medalist from the past Olympic games in Brazil. We spent a good portion of the shoot just chatting with this real-life married couple and wishing we could hang out with them the whole rest of the weekend. You know when you meet someone who is so cool and just so talented and down to earth and beautiful, yet incredibly kind and humble? That's the Johnsons. We left the shoot feeling so encouraged by their words and their own ambitions in life. Still can't get over this hoop bouquet and that silk hand-painted fabric. I want all of my things to be covered in it. Pebble and Stone nailed it with the ring and necklace! They stuck to raw, edgy stones while emphasizing the copper that we had scattered throughout our details. This stationary set from Cheer Up Letterpress was the best combination of light and airy, mixed with muted organic tones. I wish you could feel the texture of the paper via this blog post. But just look at it with your eyes - Made to be Mine captured it perfectly. We loved working with Leiana and Kate from B.Loved Studios SO much on past events, that we couldn't wait to work together with them again! Seriously...we cannot recommend these two ladies enough. They always deliver beautiful and natural-looking styles right on par with our vision and are an absolute joy to be around! I think everyone in Central Illinois has heard about the opening of The Cannery by now, but just in case you don't talk to other humans or use social media, you need to know that this space is truly a great event venue! 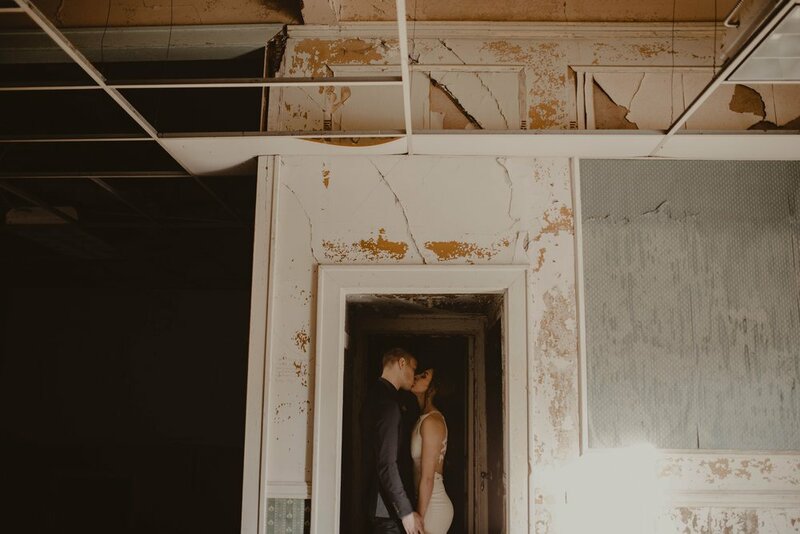 It comes with good bones (exposed brick, wood beams, and concrete floor), has historical value from 1895, and the space is completely versatile, so each wedding starts with a clean slate. There really isn't any reason why two weddings should ever be the same at The Cannery- we were dreaming up all the different ways it could be utilized while we were there. We are super proud of Amy and Brandon, who only just recently purchased the building and it's surrounding land. The work they've put into rejuvenating this place is unreal (and probably way more than any of us realize). Within only the few months that it's been officially open for business, The Cannery has already served as a hub to the surrounding community and has given the town of Eureka new life. We are excited about the future plans and dreams the Knapp's have in store for this place. We were just blown away by Amy's hospitality and grace with us during the shoot. She went above and beyond, letting us use the on-site kitchen, helping us load and unload our props, and showing us around the additional buildings on site to share the vision they have for those spaces. At one point, Amy told me I reminded her of a younger, miniature version of herself. I certainly hope that's a procephy come true, because I am in awe of the courage that she and her husband are teaching others, especially to their kids. This shoot was the third and final event in our styled shoot series. We decided to knock all three out in one month as part of our brand launch, so we were really feeling the final stretch of exhaustion going into this one. But the whole day we found ourselves surrounded by others who are just as passionate about creating just as we are, and we ended up going home feeling refreshed, encouraged, and having been inspired by our new friends. It's amazing the friends you'll meet on Instagram and how incredibly eager and willing people are to collaborate together. This only confirms what we already knew to be true in our hearts: humans were created for community and to be in relationship. It's amazing how the Lord continues to teach us things in the most unlikely of places.